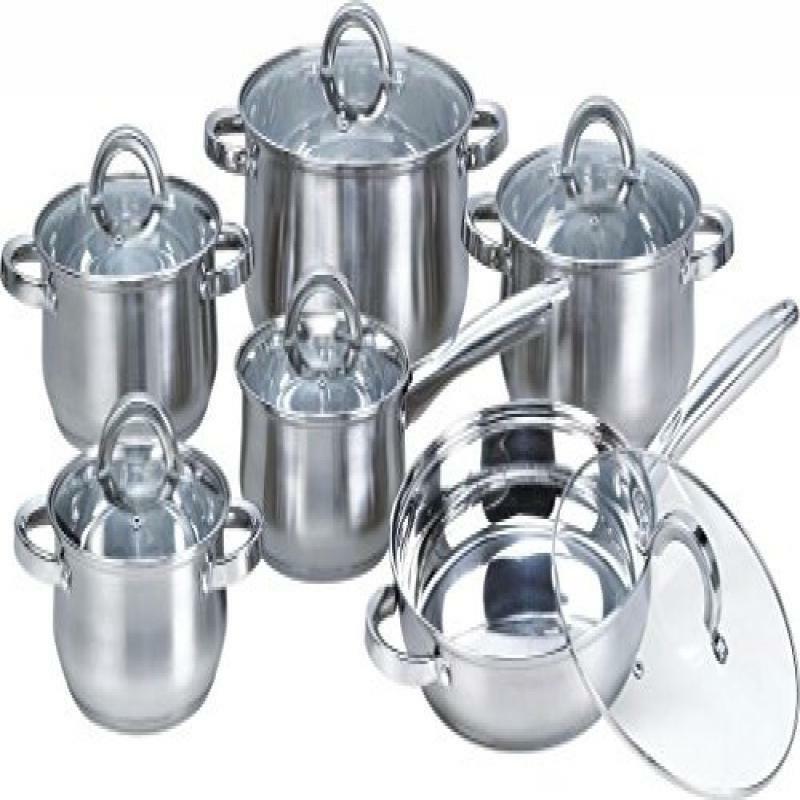 Product Description This 12 piece cookware set is made from high quality stainless steel. Each pan comes with a 3 layered thermal bottom with heat conduction. This heat technology helps food heat quickly and retains heat well. This set is suitable for all cooking sources: electric and gas stoves, or glass or ceramic burners. Heim Concept Details: Thermal Bottom The 3 layered bottom with heat conduction heats and cools quickly for precise temperature control. This heat technology heats the food from the bottom and up the side walls of the cookware. Stainless steel interior is ideal for delicately simmering sauces, sauting vegetables, browning meats or boiling pasta. Drip Free Pouring Rims are tapered for a drip free pouring. Easy to Clean Each pot and pan features a mirror polish interior and exterior for non-reactive, quick release of foods. This product is also dishwasher safe. Why make our best your best? The 12 piece stainless steel cookware is designed to meet the culinary needs of the most demanding gourmet chefs. Its thermal bottom construction facilitates effortless cooking and first-class results, enabling even the kitchen novice to whip up meals with a gourmet flair that will delight the whole family. Whether a menu calls for sauted pork medallions, a slow-cooked Manhattan chowder, or spicy sun-dried tomato sauce that simmers all day long, Heim Concept Stainless Cookware Set makes cooking it a joyful experience. Whats in the box: 10.5 inch Fry pan with lid. 1.75 quart Sauce pan with lid. 1.75 quart Casserole with lid. 2.25 quart Casserole with lid. 3.25 quart Casserole with lid. 5.75 quart Casserole with lid.